I like to think there’s no wrong way to make pasta. This recipe uses a little over double the amount of all-purpose flour compared to semolina to yield a tender pasta with a little bite. If you want a heartier pasta you could up it to a 1:1 ratio. Also the recipe is pretty lenient when it comes to the amount of beet purée for simplicity sake. When you’re working with the dough you can always add more flour or liquid depending on the consistency and texture, just knead away and it will come together. Beets can be roasted by wrapping them in foil and throwing them in a 375 degree F oven for 45 to 60 minutes. Makes about 1 & 1/2 lbs of dough, serves about 6. On a clean counter, mound the all-purpose and semolina flours together and create a well in the middle. Add eggs, egg yolks, and beet purée to the well. Use your fingers to break up the egg yolks and start drawing in flour using a swirling motion. Keep mixing in this fashion until the dough becomes sticky and difficult to swirl. At this point, take a bench scraper and gather the dough into a ball. Knead the dough with the heel of your hand for 10 minutes until smooth and elastic (it should bounce back when you press in with your fingers). If at any point while you're kneading, the dough is too dry or too sticky, add more flour or water as needed. Also if it gets too difficult to knead, you can let the dough rest, covered, for 10 minutes before continuing. Once the dough is ready, cover with an inverted bowl and let rest for 30 minutes. Place chopped beets, walnuts, parmesan, garlic, salt and pepper in a food processor. Pulse to combine, then with the motor still running, add the olive oil in a steady stream. Blend until the pesto reaches your desired consistency. If not using immediately, place in an airtight container and refrigerate. Bring a large pot of salted water to a boil. Add the pasta (about 4 oz/person as a main course) and cook for 2 to 3 minutes. Turn off the heat and reserve a small amount of pasta water. 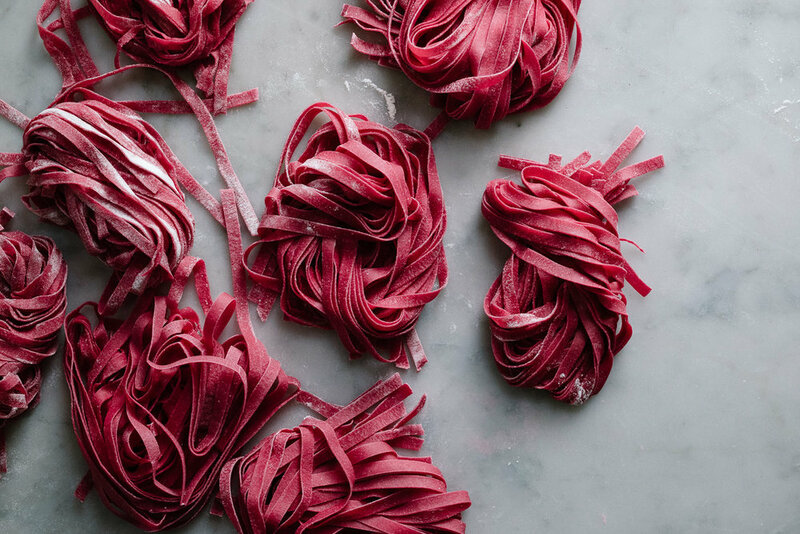 Drain the pasta then return to the pan and add beet pesto, pasta water as needed, and salt and pepper to taste. Mix it all together, top with optional breadcrumbs, and enjoy immediately.